The time of being surprised that horror mastermind Takashi Miike can direct solid samurai films has come to an end. With remakes of 13 Assassins and Hara-Kiri under his belt, he's turned into a reliable source of contemporary takes on historical samurai action, when he's not off tackling some other genre. Something those prior efforts share in common is that they're remakes of stories that have already appeared on the big screen, both from the ‘60s and both which operate within they space of hardbound realism. They offer Miike visual references through which he can adopt what worked in the originals and tweak other elements to better suit his sensibilities, often punctuating the violent aspects of those tales with his signature boundary-pushing grotesqueries. Blade of the Immortal is of a different breed, an original adaptation of a Japanese manga that also relies on supernatural elements to keep the hero moving forward through the bloodshed, and Miike's craftsmanship and visceral bravado struggle to land their blows alongside the lack of suspense involved with the protagonist's mystical plot armor. Working from the early storytelling portions of Hiroaki Samura's book series, Blade of the Immortal depicts the harrowing transformation of Manji (Kimura), a samurai whose defection from his corrupt lord earned a hefty price on his head and a legion of pursuers. After a bloody battle against those hunting for him and suffering mortal wounds, he encounters a centuries-old woman who grants him immortality by the usage of mystical worms embedded into his body, which also heal his physical damage. Decades pass, and Manji enters hiding due to his melancholy state, but gets disrupted by the appearance of a young girl, Rin (Hanu Sugisaki), whose entire family and sword-fighting school were murdered by the Itto-ryu, a rival martial-arts clan who believe in the unification of fighting styles under their superior, domineering, and no-holds-barred approach to warfare. Rin hopes to exact vengeance against them, and the guidance of others led the young girl to Manji's doorstep in hopes that he and his magical prowess will help her. The reason behind Rin's pursuit for assistance from Manji also becomes an obstacle that Blade of the Immortal must constantly work to overcome: how to elevate the stakes of an immortal, self-healing samurai's charge toward murderous vengeance against mortal enemies. It's a problem frequently taken on by stories involving Wolverine in the X-Men franchise, but the magical boundlessness of Manji's curse, or blessing, or whatever it's considered, further simplifies the concept and reinforces the situation's inevitability. In the books, Manji has an endgame presented to him, in which he'll regain his mortality as soon as he's killed a thousand evildoers … and the members of the Itto-ryu fall into that category. Those rules aren't emphasized in Takashi Miike's adaptation, though, instead relying on Rin's physical similarities to Manji's deceased sister as a means of driving him into battle after battle, which isn't enough to add depth to the scenario where he cuts through enemies -- and they futilely cut through him -- with predictable results. His enchantment guarantees survival, which dulls every victory. Manji may be a skilled samurai -- he does take out waves of opponents early on, pre-enchantment -- but he's no match for the varied, almost mythical members of the Itto-ryu, and his clashes with them hinge on his awareness of both their expertise and how his resilience can be used to his advantage. Director Miike pays attention to anime-skewed characterization in Blade of the Immortal, both in aesthetics and temperament once they cross swords, which helps to distract from the expectedness of the story's progression. A spiky-haired and bandana-clad "ninja", a monk wearing a traditional komuso basket-mask, and a seductive spear-wielding assassin in purple lend visual appeal to their interactions with Manji, combining the requisite swordplay with unique dramatic posturing between the combatants. Beyond the Itto-ryu's desire for dojo assimilation and that young-orphan / old-protector dynamic akin to Lone Wolf and Cub and Leon the Professional, there aren't many layers or sensibilities to the jumbled plotting, so those character interests are crucial to the film not devolving into a basic bloodbath. 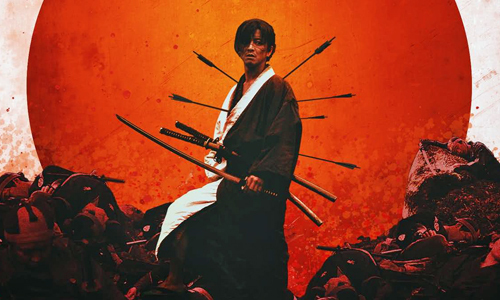 Predictably, Takashi Miike delivers brutal, almost cartoonishly gory square-offs, where the less-realistic atmosphere of Blade of the Immortal affords him the opportunity to go a little wild with the slicing and dicing. Hands and arms fly off, bodies are split in half, and some gnarly impalements happen, but the generous period-film production design and the cinematography from Nobuyasu Kita -- who also shot director Miike's other samurai films -- lend unpretentious, yet alluring artistry to the consequences of combat. The choreography does often center on dodges, parries, and strategic swipes involved with swordplay, but the primary concern of these sequences can be found in how Takuya Kimura's dedicated portrayal of Manji sacrifices his permeable body while engaging threats that would otherwise result in his demise, integrating his ability to take blows so he can land others into his evaluations of his opponents' techniques and surroundings. Elegance isn't a factor, as these are rough-‘n-tumble fights with an assortment of nasty weapons at Manji's disposal, beautifully shot and edited in their messiness. Blade of the Immortal eventually reaches a point where the "superpowers" keeping Manji alive become a storytelling obstacle instead of a novelty, in which the script bends or breaks its own rules regarding the samurai's absolute immortality and the young girl's resolve for vengeance. Villains and heroes alike make strange, fickle choices involving when to spare the lives of their enemies or when to pursue more aggressive, instantaneous methods of attack, which creates a streak of unreliability leading into the film's colossal final duel, in which Manji confronts a devastating volume of forces that'd come as close to killing him as possible with a little coordination. Lots of metal-clanging carnage evades logical happenings in Miike's signature over-the-top fashion, in which he attempts to emulate and outdo the chaos of 13 Assassins' finale; however, Blade of the Immortal lands on the wrong end of a quasi-superheroic ending that doesn't make the same kind of sense as the former's climax, suggesting that reality-bound samurai films are more in his wheelhouse.